The basics of bridges revolve around Form, Function and Structure, as we delighted to a visual feast of the variety of bridge types that exist ( or once did !). The focus of suspension bridges ranged from the squirrely rope bridge found across canyons in rainforests to the classics such as the Brooklyn Bridge. To demonstrate the dynamics of steel- volunteers both compressed and put tension on a steel rod- the former showing some buckling and the latter showing strength in tension- hence the reason we have massive towers on suspension bridges to support the delicate steel cables and framework. The history of the Brooklyn Bridge was brought alive and it was clear this is one of Allan's favorite bridges. He recounted the story of the Roebling family who engineered and built the bridge over a few generations. Most impressively was Emily Roebling who at first carried messages from her ailing husband to the crew and then over the course of 12 years educated herself in mathematics and engineering such that she became the lead on the project and first over during its celebratory opening. A side note- Mr. Roebling spent much of his time below the water in the caissons designed to keep water out of the underwater construction site and suffered from nitrogen narcosis ( originally called Caissons disease) which is what confined him to his home with only the use of a telescope to monitor bridge construction. We heard other stories about the corruption of the wire suppliers who would bring quality wire to the yard for initial inspection and then switch it out at night for a cheaper rendition- realizing this too late to change- the engineers added 150 more wires inside of each cable for extra support. An important concept in bridge building is just this and named redundancy. In the Brooklyn bridge there are 4 main cables, each attached by suspenders at two different places and in each cable are 19 bundles and in each bundle are 331 steel wires- connected to bars in anchor plates that are embedded in concrete. For our Golden Gate the same basic structure is true the question of why the bridge swayed during the 50th anniversary was because all of the people were in the middle of the bridge so it was a bit lower than the ends ! As we wrapped up with more pictures of amazing bridges around the world we started to rethink the bucket list and create a bridge list- especially to France to see this Cable Stay suspension bridge ! During the after cafe we created our own suspension bridges from cards and Kinex and had great fun putting to work the idea of belts and suspenders to hold up our creations. The Pined culinary class made delicious cupcakes complete with a miniature Golden gate on top and we feasted, as they did for the opening on another classic---the American Hot Dog ! Infinity, a topic not many would want to talk about since, well, it could go on forever. We started with a brief history of the concept of infinity begin recognized first by Zeno of Elea ,Greek philosopher of South Italy, who was born in 490 BC. He designated this small character, “ℵ” which is a Hebrew letter pronounced alef to represent the concept of something being infinite- as in having no end. John Wallis, an English mathematician in 1657,crafted the current symbol - something similar to a sideways figure * that again has no end to it. Now on to the concept of infinity- an easy example is to think of counting numbers - it starts at one and keeps on going and going. Dr. Melvin demonstrated this idea by discussing the continuum, a hypothesis originally suggested by Georg Cantor. He was born in March 3, 1845 in St. Petersburg, Russia and died January 6, 1918. He went to Humboldt University of Berlin and wrote 5 books in his lifetime that relate to math and science. During the café we followed along as Dr. Melvin explained the classic diagonal math grid that has now become Canto’ theorem- The set of counting numbers is less than the size of the real numbers. 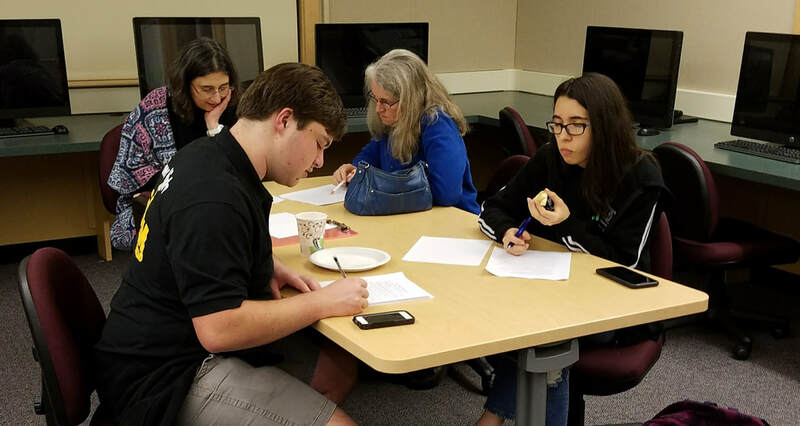 After having a snack of delicious Infinity looped pretzels, the after cafe began with a series of problems to solve to help our minds think in a more infinite way. A good place to start was with definitions and notations of set theory ( for those of us with distance-diagonal or not- from mathematics class). Then we worked some set problems-( put link to assignment here) where we worked on the cardinality of set and compared that to power set to see what similarities we might find. More fun was in store for the second set of problems where we explored infinite sets to see if we might find a paradox or two. There were some students and adults that embraced this moment to explore ideas and have mathematical conversations with someone that could help make sense of it-and a few that got a bit lost - but we all were challenged to think and explore in new ways. 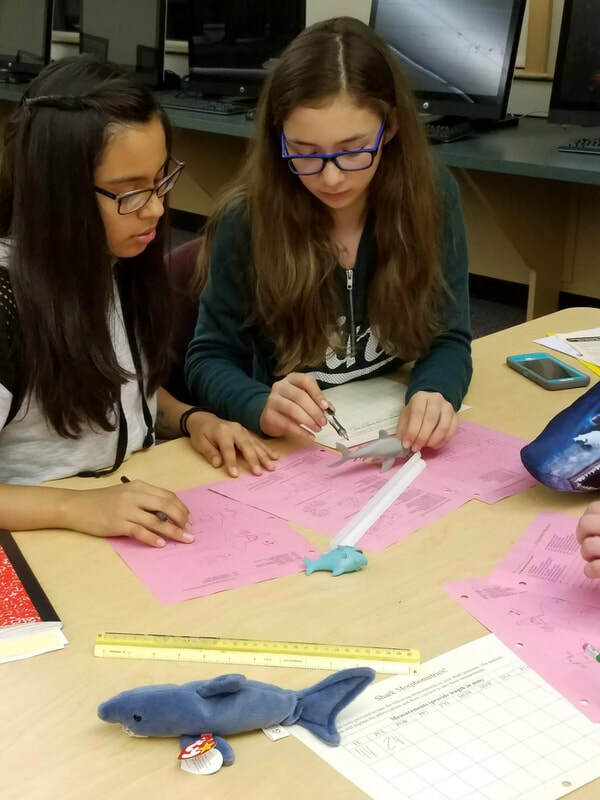 Submitted by Melissa V and edited by Judy B- Piner High STEAM club. After Café attendees--working hard and chomping on pretzels ! The central dogma is one of the many fundamental concepts all teenagers in high school are encouraged to learn. It states that the information to make proteins is encoded by DNA and this information is relayed by an intermediate molecule called RNA. Harold Marin, a local high school and junior college graduate that now works at UCSF, enlightened us on the current state of affairs with DNA technology. 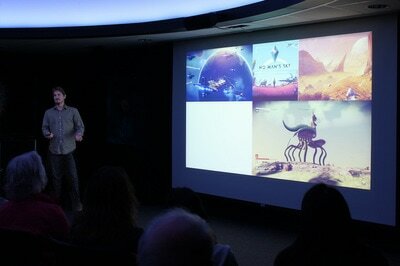 He began by showing glowing bunnies that had been genetically engineered- Now, how can that be real? For those that did not know - genetic modification is not only done to food, but also to other organisms - case in point- these bunnies! Scientists now have the molecular tools to cut and paste specific gene sequences from one organism to another. With the bunnies, a pGLO plasmid (from a fluorescent jellyfish) is used to genetically modify them to glow. 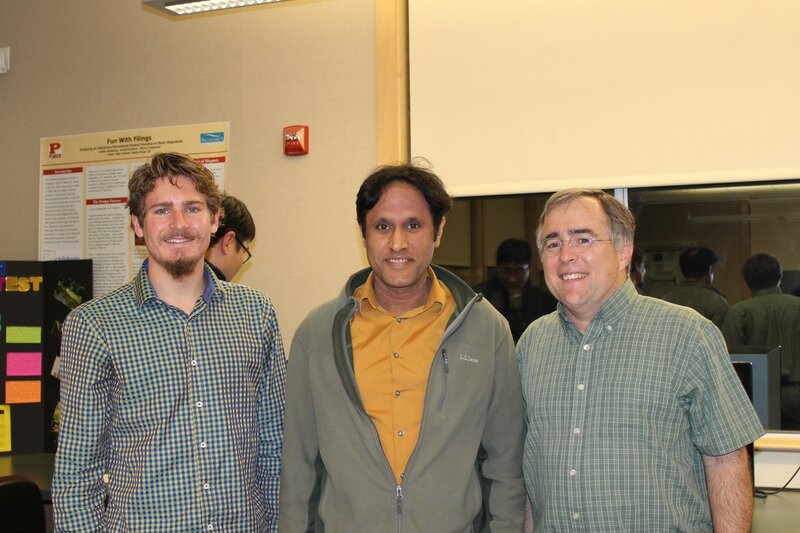 As described by Mr. Marin, CRISPR technology involves an RNA guide and Cas9, which is a protein that acts like scissors to modify gene sequences. He explained that the CRISPR project began when scientists found repeating codes in bacterial DNA. After studying these sequences they realized that it matched the codes of bacterial viruses called bacteriophages. They called these repeating codes of DNA CRISPR (for Clustered Regularly Interspaced Short Palindromic Repeats). They also found that these DNA codes associated with scissor-like proteins in the bacteria which they called Cas (for CRISPR-Associated proteins). Now why would bacteria carry virus DNA? The answer is that during a viral infection, the bacteria uses the CRISPR to recognize the foreign material and “cut” it out. This is an example of a very rudimentary bacterial immune system. By manipulating the properties of the Cas9 protein, scientists were able to apply it to other areas of biological research. When CRISPR and Cas9 work together they can scan and break the double stranded DNA, which then opens the door to insert a new DNA code within this break. As the cell repairs the broken strand, it will read the new code as its own and make that new protein that was inserted. After Harold explained the basic function of this technology he went on to discuss the work he does- which involves putting the CRISPR guide into human cells with Cas9 in order to “cut out” their genes one-by-one and compare to a control group. 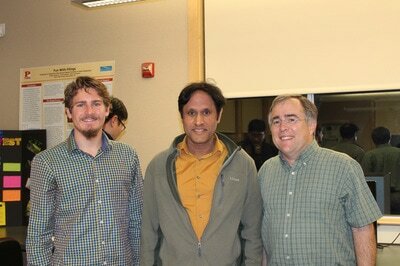 However, the work he does can go beyond gene editing on a cellular level. With this technology, scientists have been successful in manipulating genes in human embryos. Due to ethical issues, however, the embryos are not allowed to develop beyond day 14. Cas9 can also be reengineered to repress or activate it gene expression. In the world of genetics, Cas9 is one protein out of many. One of the questions brought up during the after cafe focused on the ethics involved when using this technology?. As teenagers it is our job to know how this science is applied because it will continue to be part of our future. 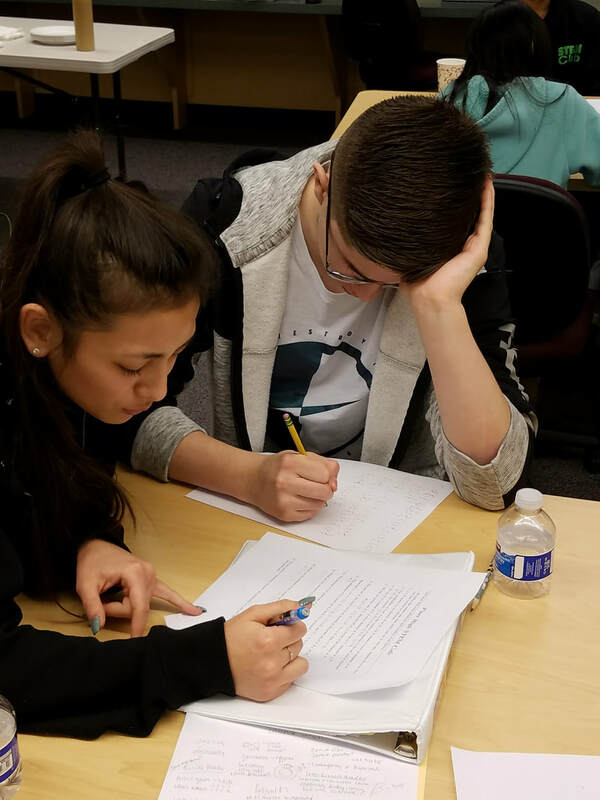 Mr. Marin signed off with a challenge for the next generation to understand, apply and appreciate this new technology and to avoid creating a society such as that seen in the movie GATTACA. 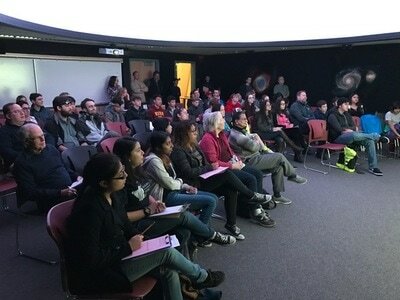 ​ kicks off our first STEM cafe ! What went on during our first Piner High STEAM Café this year? We found out about Lost Sharks! 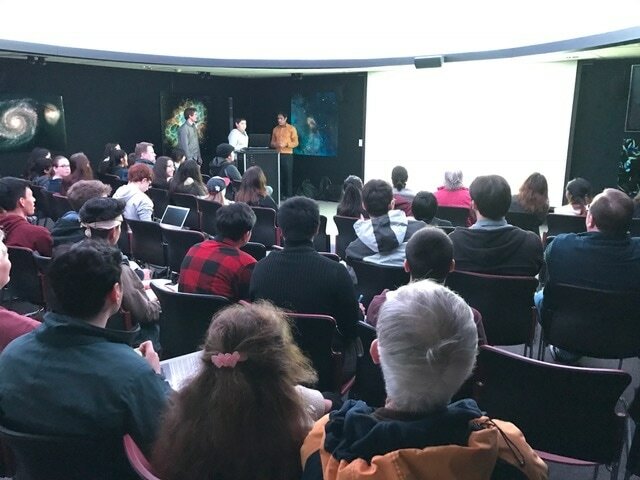 Our guest presenter Vicky Vásquez from the Pacific Shark Research Center shared her adventures in exploring and discovering uncommon sharks of the deep, one that she even got to name...the Ninja Lanternshark that glows in the dark. Her love from sharks began innocently enough- going fishing with her father off the coast of her family’s native country, Venezuela. Her life changing moment occurred when they landed a fish that had been attacked by a shark- so efficiently- that it’s brain was fully functional. As it lay breathing, eyes seeing- mouth gaping-- on the boat deck she was hooked (!) and there started her fascination with sharks and science. Fast forward through UC Davis education and a variety of fishing boat adventures to her appearance during the Discovery channel's’ Shark week talking about Alien Sharks ! 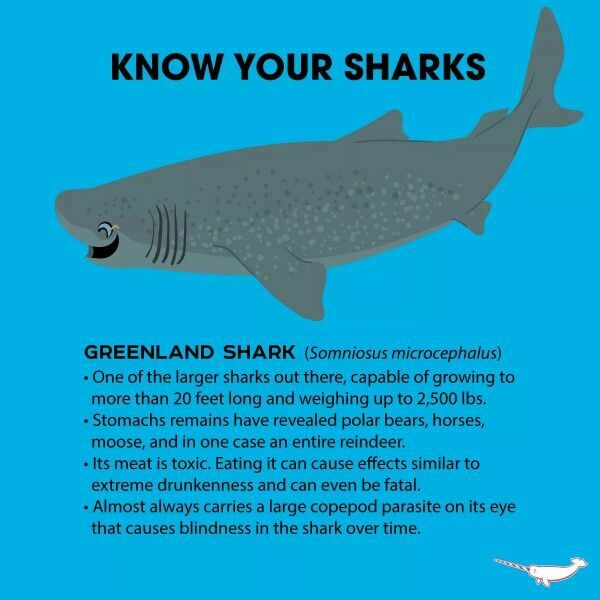 This is where she introduces the world to lost sharks such as the Greenland shark that are rare so rarely seen. She also talks about her fascinating project working with a collected museum specimen that no one else has identified- found 1,000 feet below the surface and glowing emitting an eerie bioluminescent glow from it’s eyes, spines and belly.. As she unraveled the steps to determine if her shark was indeed a new species- it occurred to me that Science operates on similar principles as does the law: A species is assumed to be similar to those that are known until proven otherwise. Taking on this task is where she learned the most about shark morphology and taxonomy. She analyzed tooth size, fin shape,photophore placement ( the glowing lights on the shark body)...until it became completely clear---this WAS a new species ! 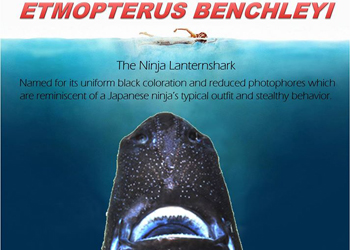 Naming a new species also has certain agreements- the scientific name of this new guy was Etmopterus benchlyi to honor the steadfast work that Peter Benchley has done to promote sharks as necessary and admirable top predators after he created such a shark fear frenzy with his movie, Jaws. 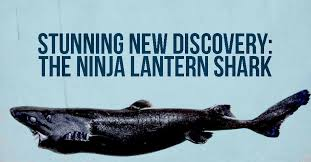 The common name was more fun and we watched a live action video with Ms. Vásquez’ niece and nephew as they discussed the merits of a variety of names- finally settling on the Ninja Lanternshark. 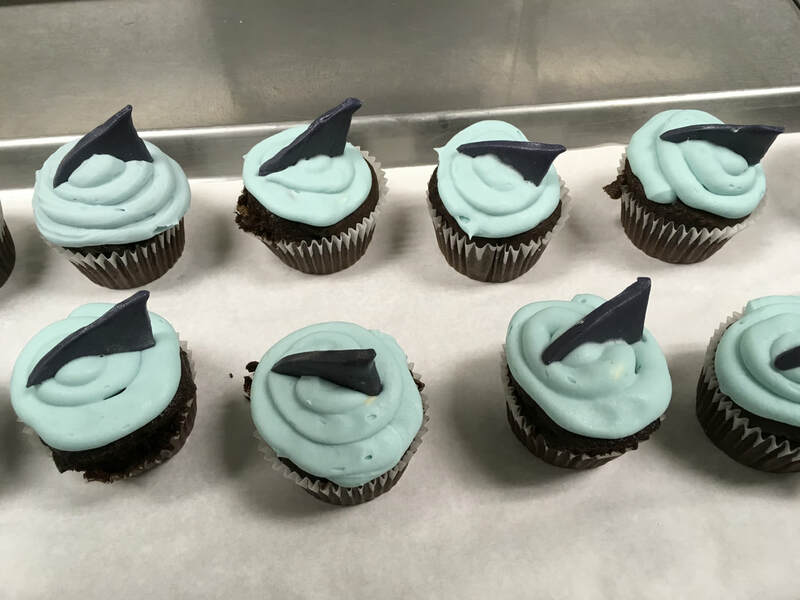 Sadly her vivacious talk came to an end but we were treated to shark fin cupcakes, watermelon shark mouths and a blue jello ocean cup complete with gummy sharks as we started further exploration in the after cafe. These treats were prepared by the Piner High Culinary catering class led by Ms. McCabe. 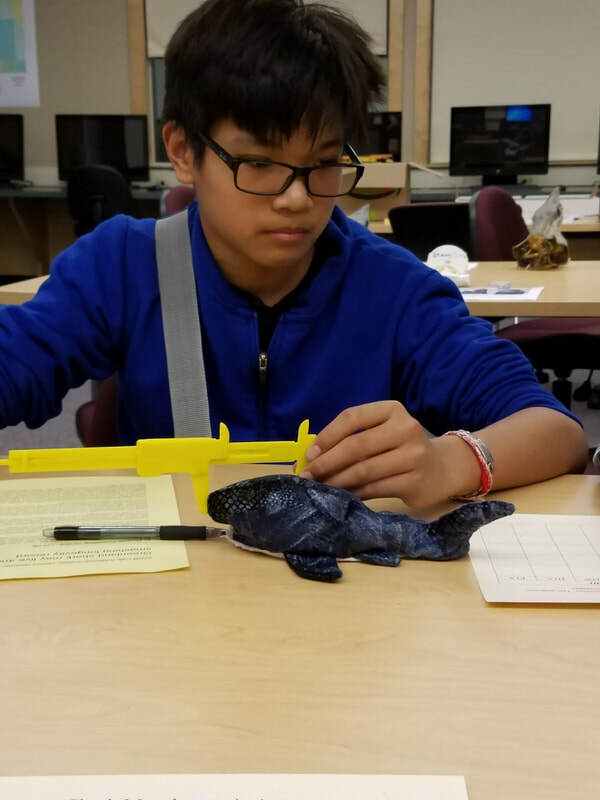 Students had the opportunity to act as taxonomists do, learning about morphometrics and measuring proportionalities of fins and tails to classify our shark specimens (some of them even being the stuffed kind). We also got to physically hold Mako shark heads and leathery shark egg cases. Having Vicky come to each table to answer questions and share more stories was indeed a wonderful way to end an exciting start to our STEM cafe season. Written collaboratively by Piner High STEAM Club. It was not a story typically seen on television. It was not the story of the three musketeers told in the salamander persona. It was a story of an isolated population, when they were ready to leave home, and the decision of choosing a mate. 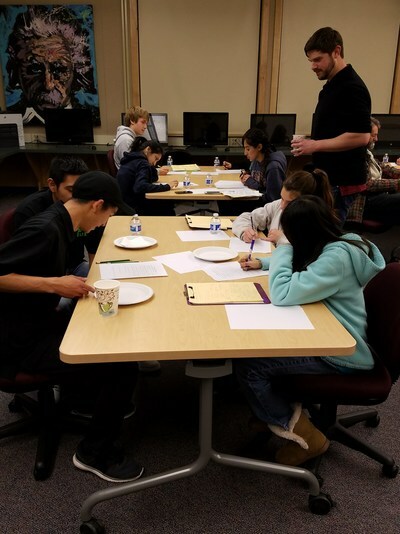 On March 9, 2017, Dr. Derek Girman, from the Department of Biology at Sonoma State University presented his research on these amphibians at the Piner High STEM cafe. The first case discussed how populations become individual species which for these animals that do not travel big distances- seems to rely on local geological events. He discussed how allotropic isolation which is caused by land barriers was responsible for creating two distinct populations of the California Giant Salamander. About two million years ago the California Giant Salamander broke in two separate populations as the Sacramento river drained to the ocean and create the San Francisco Bay. The root of Dr. Girman’s research was to determine if the two populations had a healthy genetic diversity. It was fascinating to learn about electroshocking ponds to make it easier to catch the salamanders and how he would analyze their DNA extracted from their mitochondria. What was concluded were that there were actually three distinct populations. How this was able to occur was due to prezygotic isolation, the Wilson Grove formation in Mt. Tamailpais and Sonoma County, and the Petaluma Gap (a phenomenon where there is a constant movement of air between regions). In all of the locations sampled there was a healthy genetic diversity except those in Sierra Azul. Here the salamanders looked dry and unhealthy. The cause of this is unknown, but it should be a concern. Was it due to the close mercury mine? Who knows, but further research should be conducted to figure out how we as people from California can protect our indigenous species. The next scenario was about the California Tiger Salamander and what influences them to leave their birthplace. The eggs of the California Tiger Salamander are found in vernal pools (wetland depressions that fill in rainy season). After the larvae complete their underwater development then they must undergo metamorphosis in order to leave the pools and spend their adult life on land. Once on land, they take residence in squirrel burrows. When they detect a change in air moisture level the salamanders know that it is time for rain and; thus, must lay their eggs. Because seasons are vital to the life span of vernal pools the change of rainy seasons to a dry season was an evolutionary factor that allowed the salamanders to change and adapt from water to land. The change in their shape is a factor that determines survival in their environment and, thus, the question that spurred this research was: what affects the timing of metamorphosis? There are several various factors that make contributions, but the best way to find an answer was to estimate the events of metamorphosis. Dr. German and his research team measured the largest larvae in each pool each week. If there was a decrease in growth size, then the largest larvae have either stopped growing or have already left making the largest larvae in the water slightly smaller. In conclusion to the experiment, Dr. Girman and his team determined that prey density, predator density, and population numbers are not factors to metamorphosis. Evidence suggested that metamorphosis is related to the drop of pool depth. When the depth decreases metamorphosis increases due to the beginning of the dry season. If the depth increases then the pressure to change is less urgent. This demonstrates phenotypic plasticity or an organism's ability to adjust to the environmental conditions. The third case of salamander biology involved newts. They are a different species from the salamanders, but they do have similar reproductive cycles. The main reproductive difference is that they undergo amplexus where the male grabs the female for reproduction, then he would drop a sperm packet and if she is interested the female will bury her eggs in it. The question that drove the research was: how do newts find their mates? The study revolved around the California Newt, the Rough-Skinned Newt, and the Red-Bellied Newt that all reside in Sonoma county. Due to reproductive isolation these three species do not hybridize with each other. These mechanisms that prevent reproduction are temporal and habitat isolation. Prior research indicated that newts do not use visual stimuli in choosing mates, but do they use chemical signals? The research was done in the Galbreath Wildland Preserve where all three species overlap. Based on what was known, Dr. Girman and his team hypothesized whether smell was a possibility. The experiment was done by leaving individuals to decide who their mates are in a controlled environment. After many trials using Y mazes with different scents applied to each branch, the data indicated that Rough- Skinned females did not have a preference for males of their own species but had a definite aversion to males from other species. When given the option between their own males or water they choose water 50% of the time. In contrast, males would choose any scent that was female regardless of species. Because of this they drive the mating process. Females are, thus, given the responsibility of installing a reproductive barrier between species to prevent hybridization. If newts choose a mate based on smell, do humans do the same? In the after cafe there was an activity where 12 individuals were given cologne samples and based on their smelling abilities were given the task to find their partner with the same scent. After a few minutes of sniffing each other's card, they all failed to find their correct partner. This showed us that despite what we were supposed to do we tended to choose the smell that appealed to us the most. Dr. Girman taught the Piner community that protecting these unique animals is important. Many of them are endangered due to the destruction of vernal pools. It is our duty to protect their habitat and rebuild the homes we have destroyed to ensure the future of our diverse, independent, and picky salamanders and newts. In our after cafe we did our best to apply these probabilities to our own game boards that had 15 squares. We would place our point values at the most likely places to land on and pitted our board arrangement against our table mates to see who would acquire 50 points first. Everyone had a good time while we munched on decorated dice cupcakes from the Piner Culinary team ! Not only can we appreciate how mathematical models can manipulate incredible sets of data we all felt better equipped to obtain millionaire status the next time we play Monopoly ! 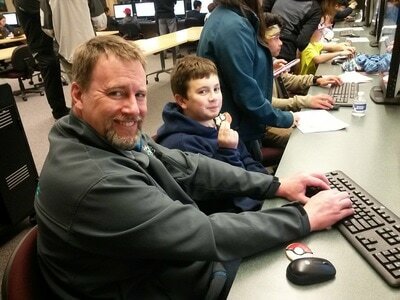 ﻿Hacking Angry birds makes physics Fun ! Last night the Piner community was treated to an inside look at the computer programming of video games. 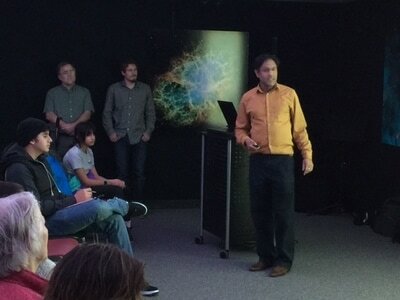 Keysight Engineers Raj Sodhi, Tim Griesser and Carson Schaefer discussed how math and physics play key roles in game design. This was delightfully demonstrated as student volunteers changed the code of the game ( hacking!) and then we saw the effect in the Angry birds game. For example, when the wind resistance was increased..the bird bounced ever so slowly and never made it to the pigs......and when gravity was eliminated the birds flew freely up, up and away! The audience became enthralled with the concept of procedural generation. How random noise is put to work with simple algorithms to create crazy complicated ever changing animals and planets such as those in No Man's sky. The video clip at the end was fascinating to see how quickly programming is evolving. 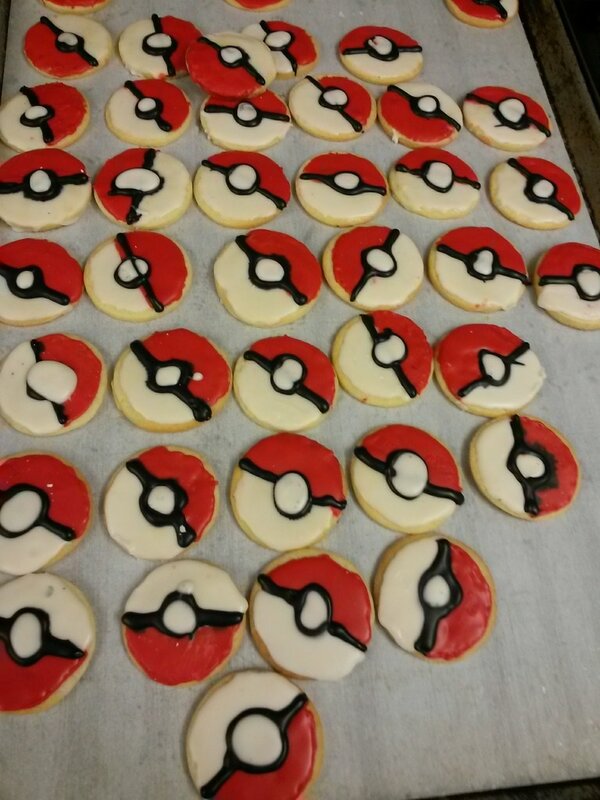 Pokeball cookies were served up for the cafe as students chose their level of engagement for programming exploration. 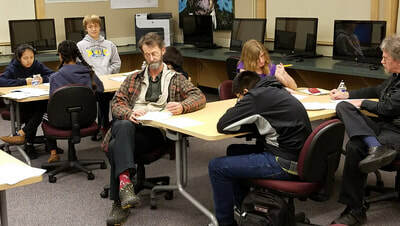 Most of the youngers sat down and worked directly with some python manipulations, whilst the beginners played around in the Hour of code website doing some basic exercises. ﻿​Do humans and yeast have anything in common? The answer is YES! Humans and yeasts have a compatibility of 30%. 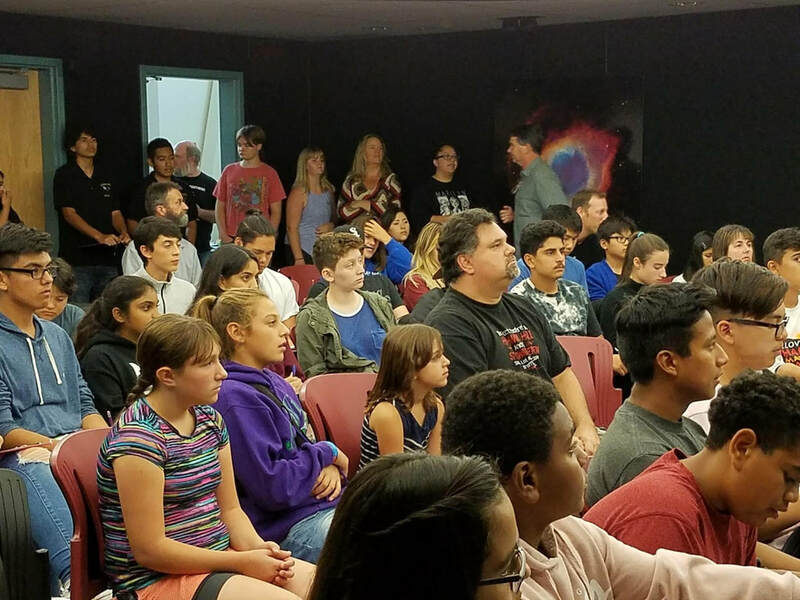 As Dr. Chong He presented in the last Stem Cafe, The Fountain of Youth is a Myth- or is it?, having a slightly similar genome can lead to scientific discoveries that might prolong life. Dr. Chong He studied in China, obtaining a Bachelor's degree in both biology and chemistry. She later went on to complete her Phd in drug design, with the goal of reducing the risks of inflammatory drugs. Dr. Chong He has been working for the Buck Institute of Age Research for a total of 4 years and has made some incredible conclusions based on her research with yeast. Yeast among many other animals are used as models in research. Why yeast? Well, yeast are unicellular eukaryotic organisms that live for about 25-26 cell divisions, each 1-1 ½ hours long. Yeast is also selected due to its small genome. Lastly as stated in Dr, Chong He’s article, “ a large portion of genes in yeast have been shown to have similar genes in higher eukaryotes that have been implicated in aging related diseases, such as Alzheimer’s disease, Parkinson's disease, Huntington’s disease and cancer.” This similarity led to the scientists collaborating on this research project to as the question, if any drugs could be found that would change the cell cycle properties of yeast to make them have live longer. The research began by selecting 14 FDA approved drugs that included ibuprofen. The research that began in 2013 finally gave them results. The yeast was injected with the same concentration of ibuprofen as humans, 200mg. “Ibuprofen extends replicative lifespan by about 17% in yeast.” The yeast cells that had been treated with ibuprofen divided a bit over 30 times compared to their normal lifespan of 25-26 divisions. The result of having a longer lifespan was also seen in the worms and the fruit flies. How does ibuprofen extend lifespan? Ibuprofen extends longevity of yeast by preventing the amino acid tryptophan from entering the cell’s plasma membrane. Ibuprofen also makes cells divide slower, therefore postponing death. This led more research projects that included the drug Rapamycin, found in Chile and used to suppress the immune system. This drug was tested in mice and was found to extend lifespans as well. This drug was also tested on dogs, which resulted in an improved heart rate and function. Along with this the project Antagonistic Pleiotropy proposed a thought that perhaps a gene or hormone was necessary when developing but the case of age once a person reached an older age. Dr. Cynthia Kenyon of UCSF experimented with worms and discovered that worms that didn’t have a growth hormone present has a longer life. Her results brought the idea that maybe the growth hormones are unnecessary once a person reaches their senior years. The key to a longer and healthier lifespan has been and will continue to be a nutritious diet and exercise. Although conclusions have been drawn that ibuprofen extends lifespans, in yeast, there is still a large amount of research necessary to prove this in humans. The next step would be testing on HeLa cells, a topic being studied by the majority of sophomores at Piner, to conclude that ibuprofen is indeed an anti-aging mechanism. Piner High STEM Coordinator....and for the moment...Cafe moderator !